Phædo or Phaedo (/ˈfiːdoʊ/; Greek: Φαίδων, Phaidōn, Greek pronunciation: [pʰaídɔːn]), also known to ancient readers as On The Soul, is one of the best-known dialogues of Plato's middle period, along with the Republic and the Symposium. The Phaedo, which depicts the death of Socrates, is also Plato's fourth and last dialogue to detail the philosopher's final days, following Euthyphro, Apology, and Crito. In the dialogue, Socrates discusses the nature of the afterlife on his last day before being executed by drinking hemlock. Socrates has been imprisoned and sentenced to death by an Athenian jury for not believing in the gods of the state (though some scholars think it was more for his support of "philosopher kings" as opposed to democracy) and for corrupting the youth of the city. The dialogue is told from the perspective of one of Socrates' students, Phaedo of Elis. 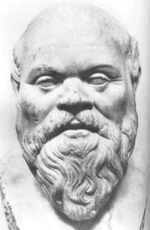 Having been present at Socrates' death bed, Phaedo relates the dialogue from that day to Echecrates, a Pythagorean philosopher. By engaging in dialectic with a group of Socrates' friends, including the Thebans, Cebes, and Simmias, Socrates explores various arguments for the soul's immortality in order to show that there is an afterlife in which the soul will dwell following death. Phaedo tells the story that following the discussion, he and the others were there to witness the death of Socrates. Socrates tells Cebes to "bid him (his friend) farewell from me; say that I would have him come after me if he be a wise man" Simmias expresses confusion as to why they ought hasten to follow Socrates to death. Socrates then states "...he, who has the spirit of philosophy, will be willing to die; but he will not take his own life." Cebes raises his doubts as to why suicide is prohibited. He asks, "Why do you say...that a man ought not to take his own life, but that the philosopher will be ready to follow one who is dying?" Socrates replies that while death is the ideal home of the soul, man, specifically the philosopher, should not commit suicide except when it becomes necessary. Did you ever reach them (truths) with any bodily sense? -- and I speak not of these alone, but of absolute greatness, and health, and strength, and, in short, of the reality or true nature of everything. Is the truth of them ever perceived through the bodily organs? Or rather, is not the nearest approach to the knowledge of their several natures made by him who so orders his intellectual vision as to have the most exact conception of the essence of each thing he considers? The philosopher, if he loves true wisdom and not the passions and appetites of the body, accepts that he can come closest to true knowledge and wisdom in death, as he is no longer confused by the body and the senses. In life, the rational and intelligent functions of the soul are restricted by bodily senses of pleasure, pain, sight, and sound. Death, however, is a rite of purification from the "infection" of the body. As the philosopher practices death his entire life, he should greet it amicably and not be discouraged upon its arrival, for, since the universe the Gods created for us in life is essentially "good," why would death be anything but a continuation of this goodness? Death is a place where better and wiser Gods rule and where the most noble souls exist: "And therefore, so far as that is concerned, I not only do not grieve, but I have great hopes that there is something in store for the dead..., something better for the good than for the wicked." The soul attains virtue when it is purified from the body: "He who has got rid, as far as he can, of eyes and ears and, so to speak, of the whole body, these being in his opinion distracting elements when they associate with the soul hinder her from acquiring truth and knowledge--who, if not he, is likely to attain to the knowledge of true being?" ...your favorite doctrine, Socrates, that our learning is simply recollection, if true, also necessarily implies a previous time in which we have learned that which we now recollect. But this would be impossible unless our soul had been somewhere before existing in this form of man; here then is another proof of the soul's immortality. ...polluted, is impure at the time of her departure, and is the companion and servant of the body always and is in love with and bewitched by the body and by the desires and pleasures of the body, until she is led to believe that the truth only exists in a bodily form, which a man may touch and see, and drink and eat, and use for the purposes of his lusts, the soul, I mean, accustomed to hate and fear and avoid that which to the bodily eye is dark and invisible, but is the object of mind and can be attained by philosophy; do you suppose that such a soul will depart pure and unalloyed? Socrates pauses, and asks Cebes to voice his objection as well. He says, "I am ready to admit that the existence of the soul before entering into the bodily form has been...proven; but the existence of the soul after death is in my judgment unproven." While admitting that the soul is the better part of a man, and the body the weaker, Cebes is not ready to infer that because the body may be perceived as existing after death, the soul must therefore continue to exist as well. Cebes gives the example of a weaver. When the weaver's cloak wears out, he makes a new one. However, when he dies, his more freshly woven cloaks continue to exist. Cebes continues that though the soul may outlast certain bodies, and so continue to exist after certain deaths, it may eventually grow so weak as to dissolve entirely at some point. He then concludes that the soul's immortality has yet to be shown and that we may still doubt the soul's existence after death. For, it may be that the next death is the one under which the soul ultimately collapses and exists no more. Cebes would then, "...rather not rely on the argument from superior strength to prove the continued existence of the soul after death." Socrates then proceeds to give his final proof of the immortality of the soul by showing that the soul is immortal as it is the cause of life. He begins by showing that "if there is anything beautiful other than absolute beauty it is beautiful only insofar as it partakes of absolute beauty". Consequently, as absolute beauty is a Form, and so is the soul, then anything which has the property of being infused with a soul is so infused with the Form of soul. As an example he says, "will not the number three endure annihilation or anything sooner than be converted into an even number, while remaining three?". Forms, then, will never become their opposite. As the soul is that which renders the body living, and that the opposite of life is death, it so follows that, "...the soul will never admit the opposite of what she always brings." That which does not admit death is said to be immortal. Socrates thus concludes, "Then, Cebes, beyond question, the soul is immortal and imperishable, and our souls will truly exist in another world. "Once dead, man's soul will go to Hades and be in the company of," as Socrates says, "...men departed, better than those whom I leave behind." For he will dwell amongst those who were true philosophers, like himself. ↑ Plato, Phaedo, 57a–61c (Stph. p.). ↑ Both are translated in two volumes by L.G. Westerink (1976–7), The Greek Commentaries on Plato's Phaedo, vols. I & II, Amsterdam: North-Holland Pub. Co.
↑ Gallop 1996, p. ix. ↑ Andrew David Irvine. Socrates on Trial: A play based on Aristophanes' Clouds and Plato's Apology, Crito, and Phaedo, adapted for modern performance (Toronto: University of Toronto Press, 2008). Gallop, David. "Introduction." Phaedo. Oxford: Oxford University Press, 1996. Vii-xxiii.